Danny Boyle’s latest thriller is a film that bounces all over the place with a plot that is both convoluted and completely outlandish. Twists and turns are plentiful, and at times the film is hard to follow. However, it is directed with a style and vision that only Boyle can pull off. James McAvoy stars as Simon, an art auctioneer who is violently hit in the head by criminal Franck (Vincent Cassel) during an art heist gone bad. When Simon regains consciousness, it is discovered that he also has amnesia — he cannot remember anything that happened after the damaging blow to the head. His memory is crucial, as it turns out that he had hidden an extremely valuable painting during the heist, sending Franck and his goons home empty-handed. Franck begins torturing Simon in a desperate attempt to find its whereabouts. Realizing Simon isn’t bluffing with his amnesia, Franck sends him to a hypnotherapist, Elizabeth (Rosario Dawson), in a further attempt to unlock the memories of where the painting might be. From there, the film bends in all sorts of directions, and there are enough dream sequences shown to make it very difficult to know just what is real and what is fantasy. This is a film that must be taken at face value; it asks its audience to go with the flow and not think too much about what is happening on screen. So much of it is far-fetched that these jumps in logic are bound to infuriate some. For a good 3/4 of the film, it’s incredibly difficult to determine what exactly is happening. A huge twist near the end puts things in perspective, and it is in this way that the film rewards patient viewers. Sure, it may not entirely make sense, but then again the film’s concept itself is pretty ridiculous. In the hands of a lesser director, Trance could easily be a middling affair. However, this is Danny freakin’ Boyle, so at the very least it’s full of eye candy. Dazzling shots, vibrant colors and a rush of a soundtrack (composed by Underworld’s Rick Smith, no less) all help make Trance fly by. The cast, of whom McAvoy, Cassel and Dawson are all given nearly equal screen time, is strong, and they play off each other rather well. The arch of McAvoy’s character is particularly invigorating, and he delivers what may be his strongest performance yet. It is Dawson’s performance, however, that people will remember most. She is completely believable as a hypnotherapist, which is a major feat in itself. I could listen to her soothing voice all day long. While Trance may jump around a bit too much for its own good, it remains a solid thriller that is rewarding enough for those who sit through till the end. It is the type of film that begs to be seen more than once, but at the same time it is perhaps not strong enough to warrant repeat viewings. Great write-up Eric. Been dying to see but can’t seem to find the time. Need to get on it. Thanks, Mark. Don’t feel too bad if you miss this one in theaters — it’s solid, but it would be just fine as a rental. Not Boyle’s best, but his most fun and exciting in awhile and that’s really saying something considering what he’s been churning out the past couple of years. Good review Eric. Hmm, not sure I agree entirely. In terms of his recent work, I think 127 Hours and Slumdog Millionaire are both far better films. But you’re right, this was a fun movie anyway. Nice Eric, I hope I can get out to see this in the theaters before it runs out. I missed the press screening for this but I figure it might be better as a rental. “For a good 3/4 of the film, it’s incredibly difficult to determine what exactly is happening” That’s kind of what I figured, but I still really want to see it because of the director and cast, esp. McAvoy. Yeah, that’s what sold me on this as well, Ruth. I think you’ll especially enjoy McAvoy’s performance — his character is easily the most interesting of the group. Glad to hear! He’s such a talented actor, though he seems to gravitate towards quite violent movies these days. I don’t think I will love the movie but I’ll watch it for sure, I like twists, turns and McAvoy 🙂 Great review, awesome that the guy from Underworld did the music here, seems like a good fit. This was surely a ride, with lot of twists. I like movies with twists but this one almost had too many, making me give up trying to follow it for a while. But in the end it was worth the ride anyway, giving the ol’ brain a good workout :p The soundtrack was great and so was the cast, especially the three leads. I’ve liked McAvoy ever since I saw him in Last king of Scotland, one of my fav movies. Great review as always man! Always nice to come by to the best blog 🙂 Keep those reviews coming! I felt exactly like you did except I’m willing to give it a few re-watches. I’m glad you touched on how well Dawson does in the film because I also thought she was the stand out. Thanks! Yeah, the cast in general was pretty solid, but Dawson was terrific. She also had the most demanding role, and she made the most of it. This sounds like the kind of plot that could have been a great Hitchcock/Jimmy Stewart movie back in the day…. which I know if I go in with those kind of expectations I will probably be setting myself up for immense dissapointment. It looks interesting anyway. Hard to follow plots aren’t necessarily bad, (See The Big Sleep) but sometimes in the hands of less than masterful filmakers things can indeed become so muddled that you throw your hands up about half way in and give up trying to make sense of the mess. Good review. Yeah, I know exactly what you mean. Thankfully Danny Boyle is at the helm for this one, and even when it’s confusing, it’s still a stylish affair. It all comes together by the end, too, which makes it a mostly rewarding experience. A good rental at least. It’s Danny Boyle so I’ll have to check it out but I wasn’t as impressed as many were by 127 Hours so I’m not rushing to see this. I actually preferred 127 Hours to this one, but it’s still worth a look. It’s a film that only Danny Boyle could make. Ahh I hate when that happens. It will make for a good rental at least. Nice review! Trance may be an example of style over substance, but the film is a lot of fun and the whole experience is a blast. The film is definitely not boring will keep you hooked to your seat throughout. Yes, there are a couple of writing issues that the editing tries to cover up, but for the most part Trance is a compelling and complex thriller. Thanks man, and I agree. It’s all over the place, but it’s still a fun thriller with a good twist. 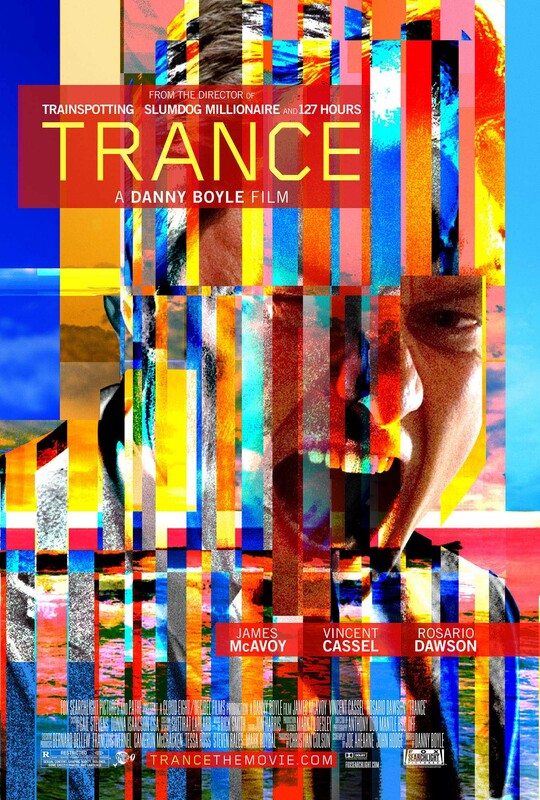 Trance does have its supporters online, though it doesn’t sound like a masterpiece, so I’ll probably catch it on dvd later. I listened to the soundtrack, which I liked, and will share tracks from soon. Yeah, a rental is probably best. I’ll keep an eye out for your soundtrack post!